I'm Darla - What Kind of Lynx Point Siamese Am I? What color lynx point Siamese am I? We definitely know who the Queen of the house is! We acquired Darla from our son. He found Darla on the side of the road one night abandoned. He would have liked to have kept her but both he and his wife are allergic to cats. So he brought her to us. She has all the markings of a lynx point Siamese, just not sure of the color. Her eyes are the gorgeous blue of your typical Siamese, she has the M on her forehead, darker color on all points except tail (it had been all but been completely destroyed, we're thinking from a vehicle engine and had to be amputated; she now has the cutest little stump), and paws (her paw pads are a cross between dark gray or brown and dark pink) and striping on her face and legs. All darker colors appear to be darkening. She is playful, sweet, loves attention, talks when she wants something, and likes to cuddle. She is approx. 5-6 weeks in these pictures, she is now 7 weeks. I will enclose a few pictures to see what you think. 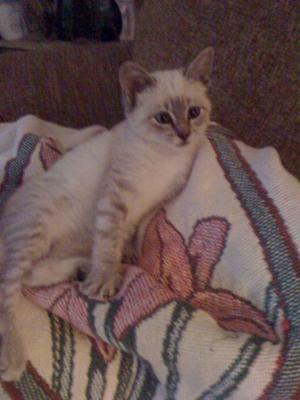 The picture you have on your site showing the lynx point Siamese, looks just like her only an older version. Our vet could not tell us exactly what breed she is, only that she may be Siamese. He's more into dog breeds than cats. Hi Amy, thank you for sharing your lovely story about Darla. Your question about her point color sent me back to my books as it can be difficult to identify Siamese coloring from photos, especially when you don't know what color the parents were. 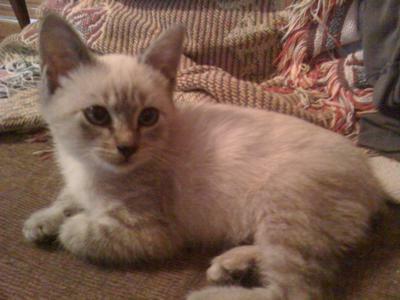 In my opinion, at the moment Darla looks most like a Lilac Lynx (Tabby) Point. Lilac is a dilute, or lighter version of, Chocolate, and in a Lynx Point this coloring may appear as brownish, especially where a red tabby may have been involved somewhere in the mix. So that's my best guess. She's gorgeous, and it will be interesting to see how her color changes as she gets older. Interestingly, I received another query about coloring on the same day as yours, which you can see here What color is this little guy? Comments for I'm Darla - What Kind of Lynx Point Siamese Am I? We adopted our little Biscuit from someone who found her on the road. She used to be really lovable and wanted to be held, but we haven't had her fixed yet and ever since she came into season she doesn't like to be held anymore. I'm hoping that after she is fixed she'll be loving again. She's super playful. She loves bows and paper that has a crinkle sound. I don't think his tail was mutilated. My kitten has a nubbin tail and the same markings. He is a little darker though. That's because his father was orange Manx tabby and mother was Lilac Point Siamese. She's a lilac. I adopted a Lynx/Tortie point from my local animal shelter and she is absolutely adorable! The sweetest and most playful cat I've ever owned. She loves to sleep on me where ever she can fit in. Although she's not quite as vocal as most Meezers we love her so much. I hope you enjoy your baby as much as I do mine. They really are a great breed of cat and I wouldn't, couldn't replace her! She is a Tabby mixed with Siamese. I have one - we also found him, he was left to die from an infection. He is missing two toes, we fixed him up and he is a happy fat cat XD. I also have another Siamese mix but she looks like a normal Siamese, blue eyes and everything and she is mixed with a bob tail. I'm not sure what kind of lynx point, I found this page looking for that answer myself for my kitty, but if this is helpful my kitty is a Siamese, Ragdoll, Manx mix. And they look very similar. We just adopted a ten-week-old Lynx Point Siamese from our local Humane Society. We believe that she is a Lilac Point. We fell in LOVE with "Tia" as soon as we saw her and knew we would be taking this one home. After reading several write-ups about this particular breed we are just thrilled to have her! I too would be very interested to see Darla's colours as she gets older. I have a rescue kitten and am trying to find out her breed. I was told she was a Seal Point Ragdoll, but she has lynx markings and so I thought she was a Seal Lynx Ragdoll, but looking at your kitten, mine looks just like her. Hi, I too have a gorgeous Lilac Lynx Point who looked just like your little Darla, except with a tail. He's the most affectionate cat I've ever had. He loves to sit on my left shoulder and nibble on my ears. We found him abandoned at our home when he was almost four weeks old. We raised him with our other cats but he never really fit in, that is as far as they were concerned. He's quite a Mama's boy and would gladly cuddle all day. He's adopted a neighbor as his second Mom and likes to visit her a couple of times every day. As he got older his fur darkened a bit but not too much. At age three he became quite ill, the vet diagnosed him with FIV and FeLV, stating that he was most likely born with both. We had him on special treatments and the FeLV is gone but of course he'll have the FIV the rest of his life. He's fifteen years old now and acts almost as young as when he was a kitten. He seems to want a playmate and likes to bat at the legs of our other cats' legs. I hope your Darla loves you as much as my Binx loves me. He tells me and shows me all the time. I would be interested to see how her points look now. Our lynxie (Tigger) got darker with age and had a fair bit of ticking on his fur. Really, the breeder went too far with this. Darla is so lucky to have you now. You have real treasure in a lynx point; they're loyal and affectionate. Our Tiggie used to sleep in the bed every night. He died in March 2011 and we were desolate. We just adopted a new kittie from the shelter who is part lynx and tabby. He's leading us a merry dance! Enjoy your lynx point ... you're in for a world of fun no matter what colour Daria ends up being. The thought that someone abandoned her is just ... well, I can't imagine how a human being could do that. I guess they're human. Hi, I have had 2 Lynx Point Siamese cats in the last 21 years. Your cat will get darker and the points more distinct as she gets older. The points are usually striped. My kitties are gone now, I would love to have another. I miss them so much. I hope you have many years of fun with your new addition.